Did the surgeon have gauze to use? Would there be exam gloves available? After surgery would enough pain medication be available for her? How about antibiotics to treat infection? “We are out of exam gloves, gauze, morphine, and several antibiotics. While this is definitely challenging, we are still doing surgery and incredibly, we are still one of the best equipped/staffed medical facilities in the country! How would you like to have a surgery with no post-op morphine for pain control? How does a doctor do a repair of a stab wound gushing blood in the Emergency Room with no gauze, just wiping with cotton balls? Recently the Central Supply staff were cutting up “roller bandages,” old fashioned torn sheet bandage rolls previously donated by churches. These bandage rolls are being cut into strips to be sterilized and used instead of gauze until we get resupplied. Thanks for all of the churches and individuals who helped send these along! Would you pray with us that the freight containers would make their way through customs and to the hospital? If you’re looking for a place to give year-end donations, consider giving to the GREATEST NEED FUND as the hospital prepares for up coming budget cuts. We all can play a role in bringing spiritual and physical healing to the people of PNG. When Nazarene Hospital opens its doors every morning 150-200 people wait in line for their turn to be seen by a doctor. Some have been carried by friends or family from miles away. Nearly 60,000 patients are seen each year as outpatients and about 6,000 are admitted to the hospital. Here in the US there are 242 doctors for every 100,000 people. In Papua New Guinea there are 5 doctors for every 100,000 people. Of the six long-term doctors at Nazarene Hospital three will be retiring over the next few years. Who will fill the need? Nathan and I planned to be involved in missions from the time we were married. Most of the first four years of our marriage were spent in Israel while Nathan attended medical school. We returned to the States to complete residency and Nathan then began to practice Family Medicine. 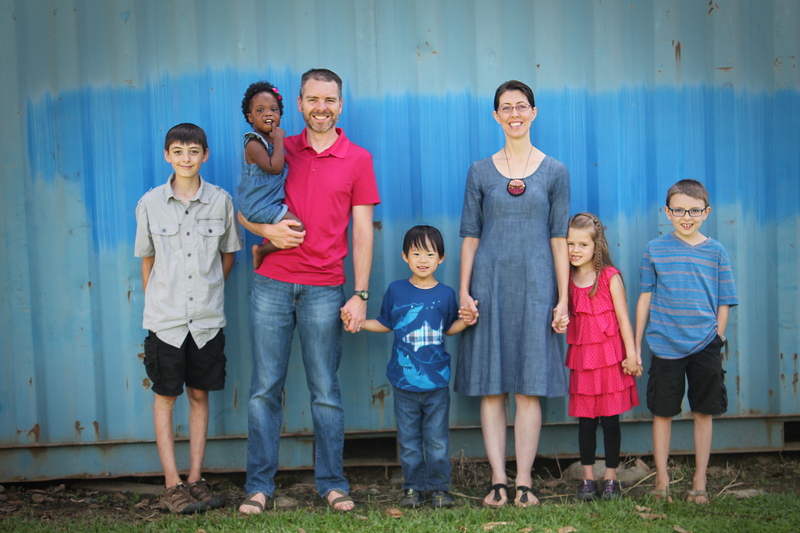 After our three biological children were born we began the adoption process to bring our son home from Hong Kong. Fifteen months later we adopted our daughter as an infant from here in the States. Both were born with Down syndrome and as God led us to adopt kids with special needs we were aware that they may come home with needs that would make living overseas difficult, but trusted in God’s plan no matter if that kept us in the States or moved us overseas. When we heard of the need for doctors in PNG in January of 2015 we were both interested in the possibility of our family moving there to help. There were several obstacles we saw, but as we prayed for wisdom God opened every door that we assumed would be closed. We now have the privilege of helping to fill the need for doctors in PNG. The plan is to move our family over in the fall of 2016. You can be involved too. We need both prayer and financial support in order to go. Visit the Support Our Ministry page to find out how you can help. The people of PNG – While rain is usually abundant there has been a drought since our summer time. Even as rain returns many people have lost their gardens which is their main source of food. Logistics of moving – We’ve begun gathering paperwork for visas and work permits. Pray for this process as it’s not uncommon for delays to happen.